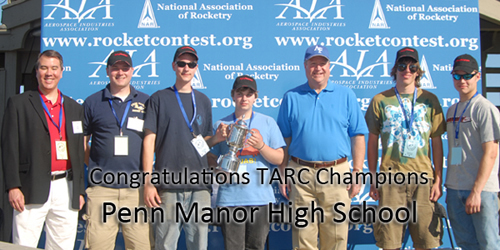 Penn Manor had an unbelievable finish at the 2010 Team America Rocketry Challenge. The high school team of Brendan Stoeckl, Jordan Franssen, Nate Bernhardt and Tyler Funk placed 1st in the nation and will have a chance to compete in England in July against teams from the UK and France. The Marticville Middle School team of Wyatt Shiffler, Tom Sowers and Jesse Stoner kept Penn Manor on the podium by taking 2nd place.